The summertime battle against mosquitoes and other blood-sucking insect can feel like a major Catch-22. You want to protect your family from bug bites and the potential diseases that come with them. But you also don't want to expose your loved ones to the possibly harmful chemicals found in typical insect repellents. Herbal Armor is the answer! 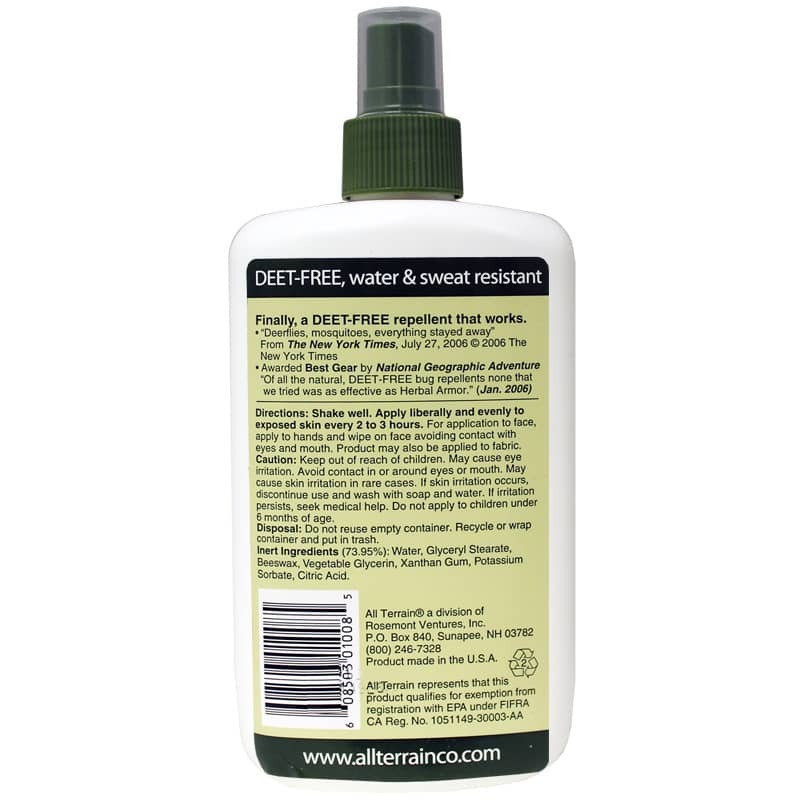 All Terrain's natural insect repellent is DEET-free and works for more than two hours. Instead of DEET, Herbal Armor makes use of oils that can ward off mosquitoes, ticks, deerflies or horseflies and other annoying insects. You'll find cedar and citronella oils - two plants that ticks and mosquitoes can't stand. Even major publications are singing the praises of Herbal Armor Natural Insect Repellent. The New York Times says it kept all the bugs away and National Geographic Adventure says it worked better than any other DEET-free bug spray. Whether you're camping deep in the woods, or just hanging out in the backyard - this is the stuff that gives you a healthy way to keep those biters at bay. It's perfect for both hard-core outdoor enthusiasts and family vacations. 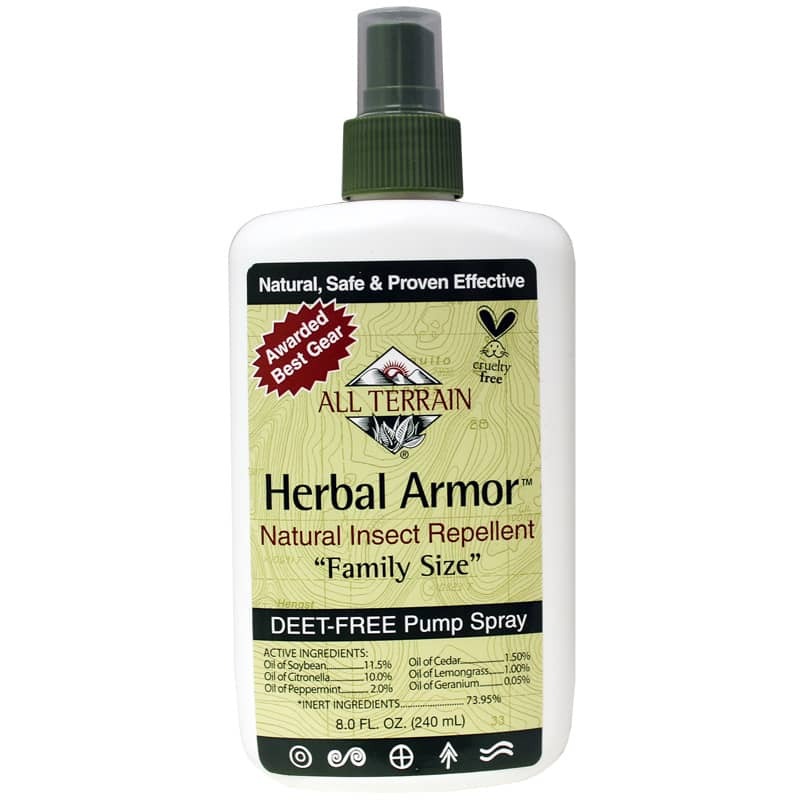 Order Herbal Armor Natural Insect Repellent from All Terrain today! Inert Ingredients: (73.95%) water, glyceryl stearate, beeswax, vegetable glycerin, xanthan gum, potassium sorbate, citric acid. Shake well. Apply liberally and evenly to exposed skin every 2 to 3 hours. For application to face, apply to hands and wipe on face avoiding contact with eyes and mouth. Herbal Armor pump spray may also be applied to fabric. Keep out of the reach of children. Avoid contact in or around eyes or mouth. If skin irritation occurs, discontinue use and wash with soap and water. If irritation persists, seek medical help. Do not apply to children under 6 months of age. I was first recommended this by a friend who was spending a lot of time in the African jungles doing ethnobotanical research. I tried it when I went to the Amazon basin a few years back and it worked really well. I was not totally bite-free but even when I've tried the super-strong DEET products, I was never bite-free in the jungle. Works well and smells a lot better than the alternative. I have used this product while on several vacations in Canada and it works great. Very safe for kids and pets. The repellent itself works quite well. The smell is much more pleasant than the chemical smell you get from the other repellents. However, after the third or fourth use, the bottle starts collapsing, and makes it extremely difficult to pump any more out, forcing you to unscrew the cap, and massaging the bottle back into shape so you can continue to use the product. Works as well as the Herbal Armour lotion- my personal preference is the lotion, but my husband likes both. We live in wooded area and have used this product for year- works for us. Herbal Armor Insect Repellent Spray kept mosquitoes away in the woods, and it smells like lemongrass - very nice! So much better than stinky deet. However, it sprays out like a lotion that you have to rub in, so it doesn't really work on clothing. I am happy that there is a product like Herbal Armor Insect Repellent Spray I can use that doesn't contain Deet or other poisons. I like the pump sprayer. I like the smell, as far as repellents go. It seemed to work fine for most things. But I was in the middle of a swarm of mosquitoes while on a hike, and they got me. Mostly where I didn't spray well enough, like on the back of my arms, and where I didn't think to spray my clothes. It seems to work well against chiggers. Herbal Armor Insect Repellent Spray works great. Herbal Armor Insect Repellent spray has worked well for our family this summer. I feel safe using it on my kids! This is my go to insect repellent which I have been using for several years. Pleasant odor and works well. Delivery of product is quick and well packaged. I like the way it goes on... not oily, but rather like a skin lotion that is absorbed. It lasts for a good amount of time also... the best part of this is that it is effective. I am definitely going to purchase this again!